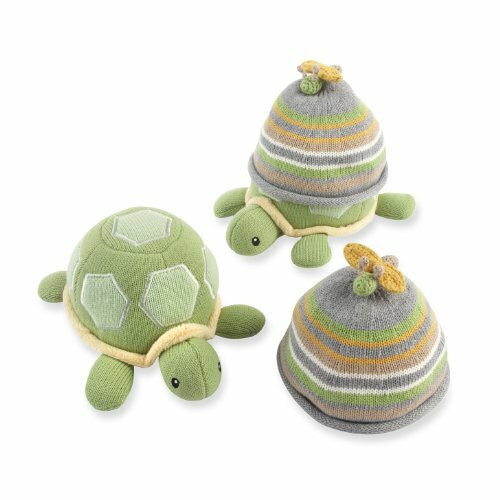 An adorable knit turtle with a super soft plush belly and engaging rattle noise delivers a delightful warm knit cap for baby to wear. So while baby is turning heads sporting his dragonfly cap, he can be holding the loveable turtle who brought it to him. Now that's a gift set that's hard to top. Features and facts: Soft knit green turtle with rattle noise holds an adorable knit cap for baby boy on its back. Knit hat features stripes of golden yellow, green, gray, taupe and white. Adorable knit dragonfly sits atop the hat. Turtles belly features soft plush fabric in yellow. Knit hat is machine washable; plush toy is surface washable. Hat size 0-6 months. If you have any questions about this product by Baby Aspen, contact us by completing and submitting the form below. If you are looking for a specif part number, please include it with your message.